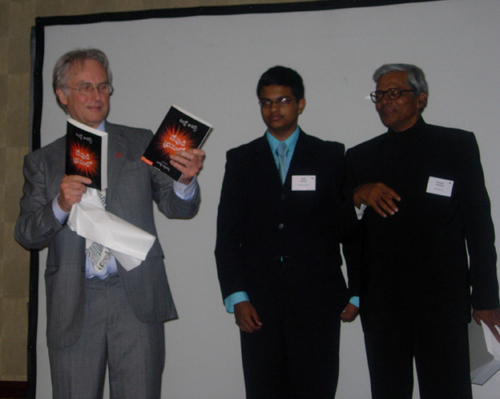 The Translation was presented to the Author in 2007 at world Atheist conference in Washington DC. In the middle Master Rohit, Grandson and the translator. Gita is the holy book of Hindus. Narla VenkataeswaraRao studied this Ancient Book from all angles and came to the conclusion that it has Devastating effect on Hindus with Karma and re-birth,as well as degrading Caste system. Narla condemned this Scripture with all logic and Human angle. He advised Indian youth to discard Gita for the sake of their future.He exposed the inconsistencies, inaccuracies of the texts, timings and sayings. Narla detested the attitude of Gita towards women in particular. The Rationalist Association of India brought out this publication under HEMA from Chirala,A.P.India. IBN Warraq in scholarly exposition brought out the criticism on Islam, Koran, Mohammad and the practices of Muslims in contemporary world. He discussed the consequences of banning Salmon Rushdie`s Satanic Verses. Prometheus Books, USA has done good service in bringing out this book which is the need of the hour. This is a thorough study of the dictotarial behaviour of Islamic Priests with the pretext of Islamic Law and Holy book. It also deeply observed the evil aim of Jihad. The author narrated how Muslim Priests oppose Human rights and values, undermine Human dignity of women. Telugu translation is first of its kind. Later other language translations followed.Hema Publishers of Chirala,A.P. published. India in Transition was written by M.N.Roy in Moscow in 1922.It shows his understanding of Indian postion under British rule with clear perspective. Nurul Hassain, as minister of Education in government of India envisaged a project to get all progressive book on history to get into indian languages. Indian Council Of Historical Research Delhi selected India in Transition also. I translated it and Dr.C.NarayanaReddi was the editor for language.But ICHR did not print it. Still waiting publication. The founder of Secularist movement in India has written several articles discussing the need for seperation of State and Church for healthy public life. He exposed the fradulant nature of godmen like Puri Sankaracharya who preach the holiness of cow and sacrifice of wife when husband dies. These articles were translated for the first time in Telugu. Anupama Publishers in Vijayawada,A.P brought out this book and released early 1970s. Humanist writer G.V.Krishna Rao got his Ph.D. from Madras University for the Thesis on Kalapoornodayam.This poem of Pingali Surana is unique in its theme and aesthetics. Krishna rao was only graduate but given permission to submit thesis in English. The examiners tried to stop him in getting the degree with silly reasons. 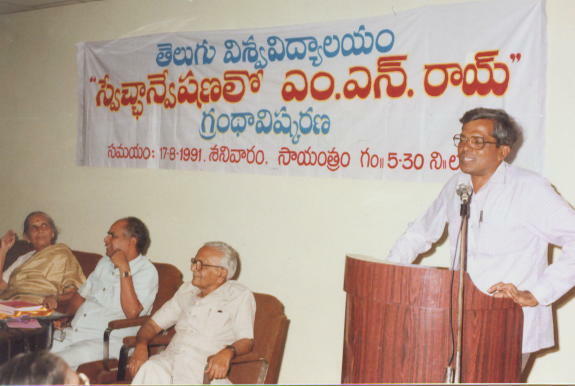 Narla Venkateswararao, editor of Andhra Prabha daily from Madras intervened and warned the examiners with dire consequences if they put illogical hurdles in confiring the degree. They saw the point and yeilded.This critical study of aesthetical angle was translated and serialised in Golkonda Patrika Telugu daily from Hyderabad in early 1960s. This book was translated in Telugu while the English edition came out of press. Humanists enjoyed this book. It deals with contemporary situations, encountered the postmodernist attacks and came out with sober alternatives of Humanist angle. Paul Kurtz put forth humanist values and practices in a masterly style and lucid manner.A guide for practice to Humanists. Autobiographical study of Agehananda Bharati resulted in banning of this book by government of India during late 1970s. Strong protests were made by writers like Kushwant Singh for banning such book. Ramakrishna Ashram pressurised the government for ban. This book exposed the shallow petty arguments and irrational contradictions of Vivekananda. Agehananda Bharati hailed from Germany, worked with Netaji Subhash Chandra Bose army in Europe,attracted to Indian culture, came to Independent India to join Ramakrishna Ashram. He was entrusted with editing of Vivekananda writings where he saw the narrow mindedness of Vivekananda. He wanted them to be published intact but the Ashram refused,lest the great Swami will be exposed naked before the intellectual world. Agehananda joined Sankara school, toured as pilgrim entire India on foot, saw rural life. He taught in universities at Benares, Delhi, visited Buddhist centers and finally settled down as professor of cultural anthropology at Syracuse University,USA. In India he met M.N.Roy in early 1950s at Dehra Dun and was impressed by his humanist thought.Bharati remained bachelor. He died late 1980s. This serial on the early life of M.N.Roy was translated and published by Telugu University.S.B. Narayan Ray specialised on the life and thought of Roy. He toured USA and Mexico as well as Europe to gather research material on Roy. He also edited four volumes on M.N.Roy published by Oxford Publishers.Roy`s early life is adventurous and fascinating. Roy started as national terrorist against British rule in India, sought german arms in vain, left India to return only after 15 years. Meanwhile he landed in USA and married Evelyn, met Lala Lajpat rai, founded communist party in Mexico, attracted the attention of Lenin, participated in world communist movement as theoretician and practical leader. The speeches and articles of M.N.Roy were edited and compiled by his humanist wife Ellen. She was great admirer of her husband and followed him everywhere, took short hand notes of the speeches and preserved them carefully. The present book was arranged carefully to show the evolution of M.N.Roy as a Radical Democratic Party person who gradually abondoned the Partisan party attitude and moved into broad humanist movement with deep thought and scientific attitude. M.N.Roy explained the defects of political party system and pleaded for people`s movement. He also asked for ethics in politics which is woefully lacking in the present set up. China is always enigma to political observers. M.N.Roy visited China twice, met top leaders, participated in Chinese communist movement as advisor. He was asked to guide Chinese Communist movement during late 1920s. After his return from China Roy wrote extensively about China starting the early days. Very lucid explanation of the historical events. Telugu ACademy published this translation. M.N.Roy`s monumental theoritical work on Renaissance and Humanism. Erich From in his Sane Society highly recommends this book for proper understanding of Renaissance. Roy explained the failures of systems like Communism, Fascism and Liberalism. He discussed the alternatives and came to the conclusion based on the scientific evidence available-to humanism. He stressed on values especially FREEDOM as supreme value for man. Roy wrote these two volumes in the early 1950s just before his death in 1954. The translation was brought out by Telugu Academy. Amritlal Bhikkubhai Shah popularly known as A.B.Shah published this book in early 1960s with remarkable clarity and examples. He gave importance to the social problems and ethics also from scientific point of view. M.N.Roy`s thesis on humanism also was discussed critically. A very good book for students at graduate level. It was published in telugu during early 1970s and ran into couple of editions. One of the earliest studies of sociology in India. the field surveys are very good . they inspire the sociology students and researchers in india.The exhaustive book was brought out by Telugu Academy,Hyderabad,India. Indian constitution adopted provisions from various countries. It is big in size. But popple are not acquainted with its provisions. There are some amendments too.Justice Reddi discussed the complicated constitution in a lucid manner. We have a Republic-Can We Keep it? There are many dangers to the constitution if they are not properly understood and implement in its true spirit.Democracy is delicate and it should be preserved with understanding of human dignity, equality of rights and values. Ofter constitution is violated. Justice Reddi brought out these aspects with caution. Governor`s role is important when crisis arises in state politics. they often indulge in politics and violate natural justice. Sometimes they take sides and forget constitution. Hence the need to understand the rights and responsibilities of governor under constitution. Justice Jagan Mohan Reddi served the Osmania university after retiring as Supreme Court Judge. When Osmania University was in crisis with academic choas he came to the rescue and restored order. Some persons like G.Ram Reddi exhibited their double standards and sabotaged academic impartiality. Justice Reddi exposed Dr.Ram Reddi`s actions and brought out how he dealt with students, staff in academic administration. This was serialised in Udayam Telugu Daily(published from Hyderabad). It was not published in book form.